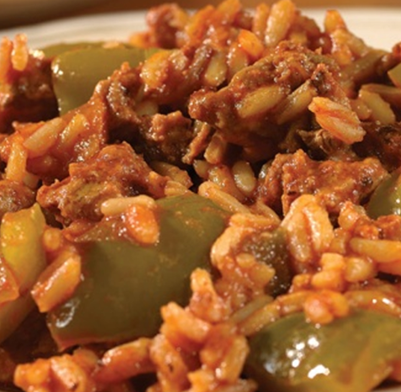 Do you love stuffed peppers but hate the hassle? Why not deconstruct and save time! It might not be as presentable, but it’s just as delicious – we promise. Heat the oil in a pan and add the turkey mince, onion and basil leaves. Stir consistently to separate the mincemeat and continue until the turkey is browned. Pour away any excess fat. Next, add the V8 Original and the white rice and bring to the boil. Reduce the heat to a low setting, cover and cook for a further 10 minutes. Finally, stir in the peppers and cook for an additional 10 minutes until the rice is cooked and the liquid has completely absorbed.